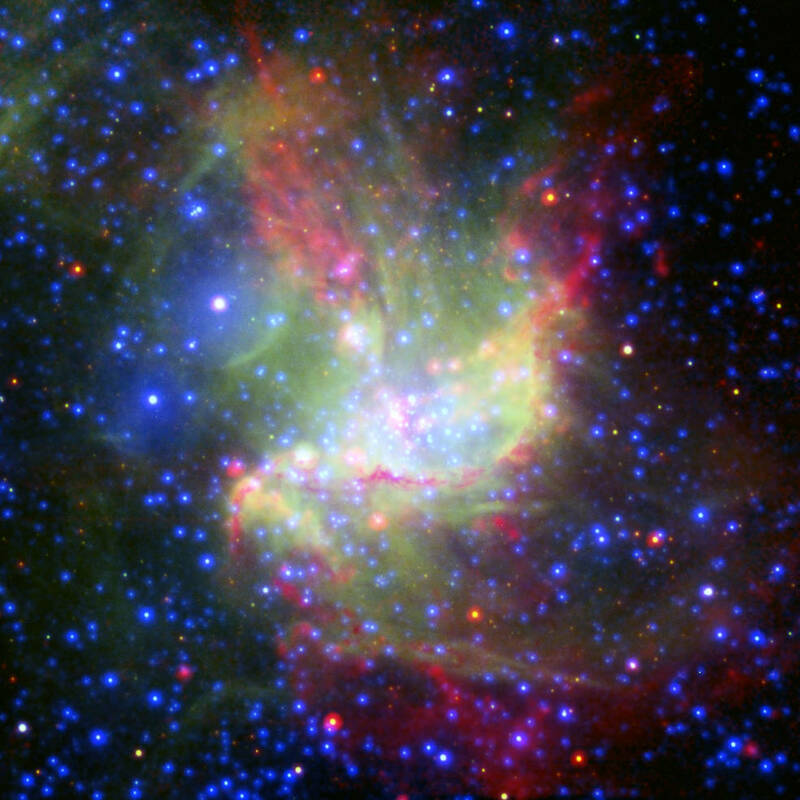 NGC 346 is a nearby proxy for the myriad star-forming regions that existed when the universe was ablaze with star formation just a few billion years after the big bang. Astronomers do not have telescopes powerful enough to study the details of star formation in these faraway “baby-boom” galaxies. 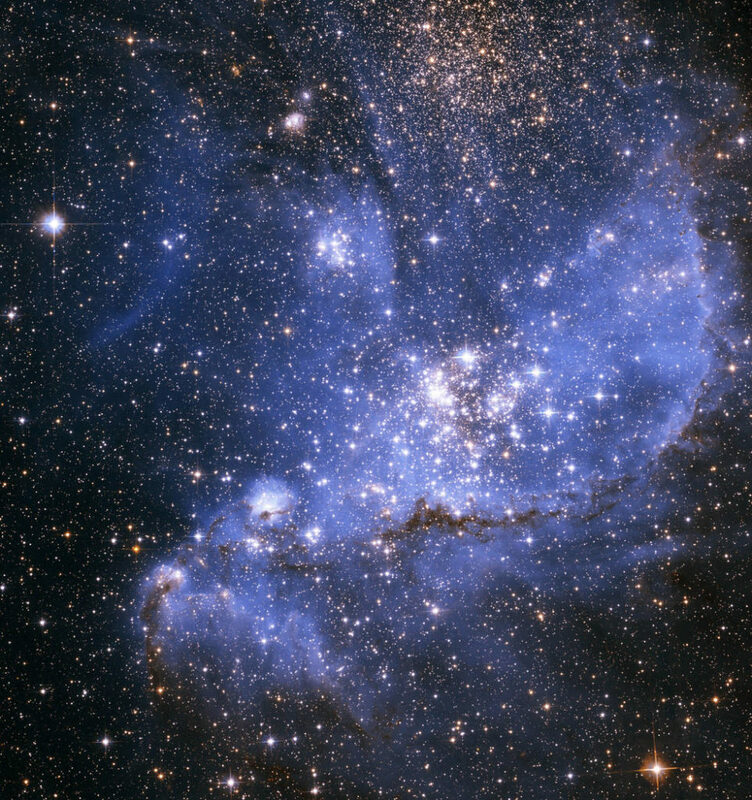 The Hubble Space Telescope imaged NGC 346 to identify the optically bright stars. However, to understand the star-formation process astronomers must peer through the dusty stellar nurseries. Observers will use the sharp infrared vision of NASA’s James Webb Space Telescope to study NGC 346, which could help them develop a clearer picture of how the galaxies of long ago churned out stars at such a tremendous rate. Another link between NGC 346 and the star-forming heyday is the large amount of young, massive stars residing in these fertile areas. These stellar giants wreak havoc on their environment by unleashing searing ultraviolet radiation and powerful stellar winds (streams of charged particles). Energy from these “bullying” monster stars can destroy star-forming clouds of gas and dust and disrupt the disks encircling stars where planets can form. It may be harder to make planets in environments largely lacking heavier elements. “When you have an environment deficient in heavier elements, the ultraviolet radiation from high-mass stars can penetrate much deeper into a molecular gas cloud where stars are forming, so it’s hard for low-mass stars, let alone planets, to form in such an environment,” Nayak said. Dust may be a nuisance for many people, but it is important for star formation. It helps to shield the dense, cold, gaseous cloud in which stars form from scorching radiation and harsh stellar winds that could tear the cloud apart. “Dust plays an important role with providing a safe haven for a stellar nursery,” Meixner explained.